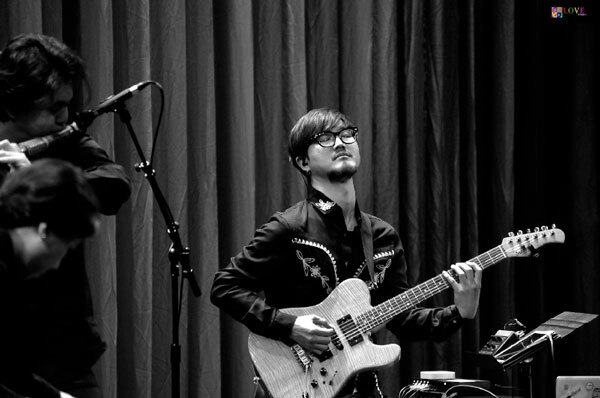 Black String is a unique world music quartet which fuses traditional Korean music with contemporary improvisational music. The group was founded in 2011 as part of a government-sponsored Korea-United Kingdom cultural exchange program. 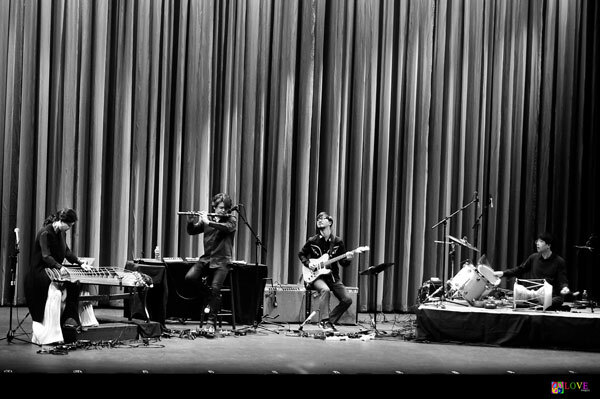 The group consists of four talented musicians. 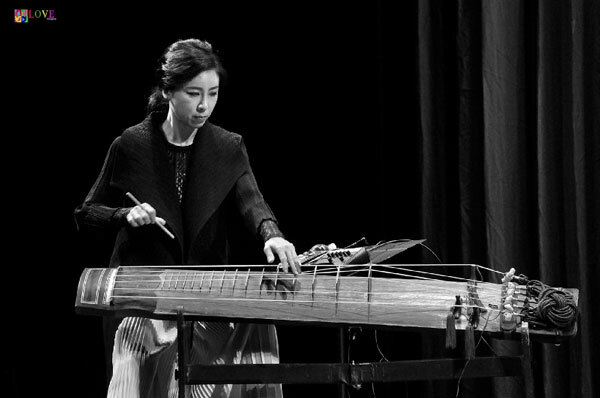 Yoon Jeong Heo plays the geomungo, a traditional Korean stringed instrument in the zither family. 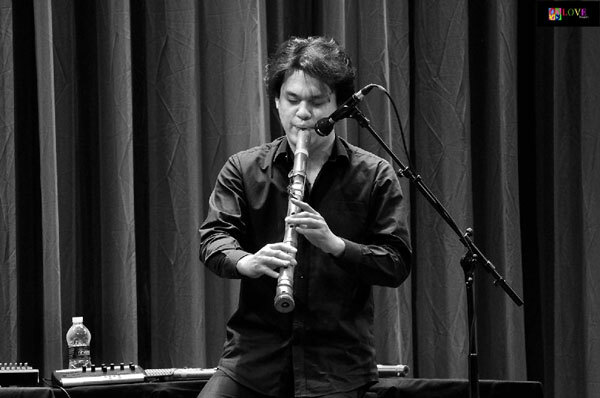 Aram Lee plays a variety of Korean wind instruments which include the danso, a notched vertical bamboo flute frequently used in Korean folk music. 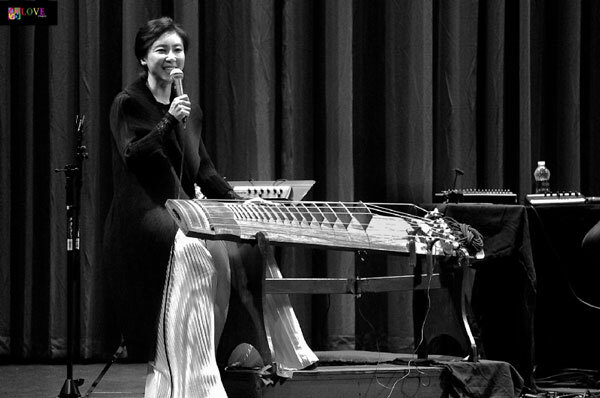 He also plays the yanggeum — a hammered dulcimer which has metal strings that are played by striking them with a bamboo stick. 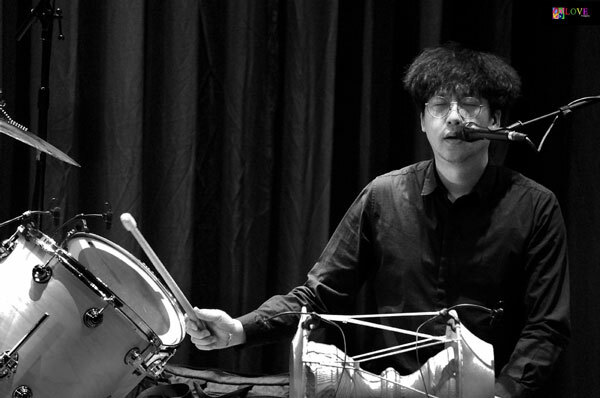 Percussionist Min Wang Hwang plays the drums. He sometimes plays a special drum called a janggu, which features an hourglass-shaped body. Lastly, Jean Oh plays electric guitar. He also creates unusual sound effects for the group using various electronic devices. 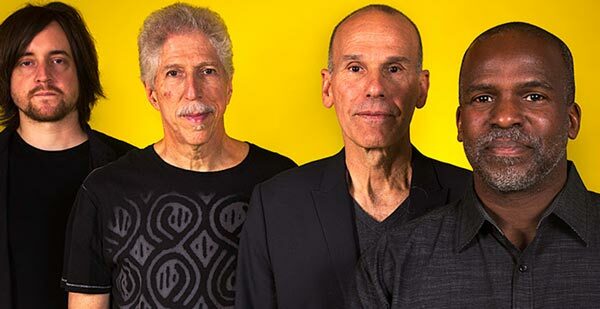 Currently on tour in the United States, on Thursday, January 25, 2018, the musicians of Black String made a stop at Toms River, NJ’s Grunin Center of the Arts, located on the campus of Ocean County College. Here, they performed a concert for an audience of world music lovers of all ages. Like jazz musicians, the instrumentalists move as they create sound in motion. As the group plays, they create a soundscape which comes across as both traditional and contemporary in nature. 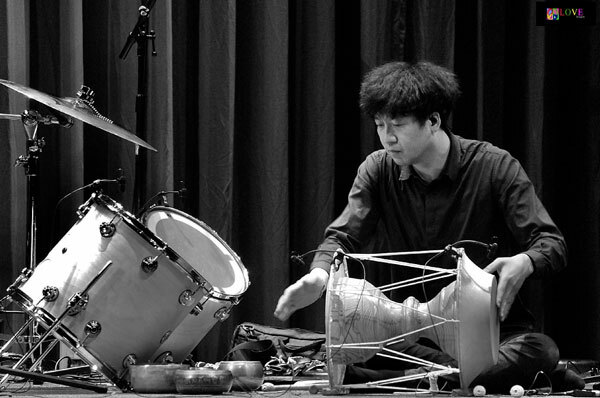 On this piece, percussionist Min Wang Hwang sits on the floor and taps either on the tom tom head or on the side of his janggu drum to produce a metallic sound. Yoon Jeong Heo slowly bobs her head as she plays the geomungo. 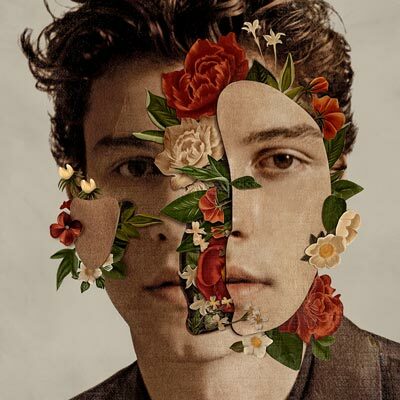 The music builds in intensity as the various instruments create rhythmic layers of acoustic/electronic sound both in terms of texture and dynamics. Acoustic and electronic strings sing as percussion steadily keeps time. Eventually slowing down, the ethereal sound of the bamboo flute takes the spotlight accompanied by an electronica-influenced background. After a dramatic climax — where all four instrumentalists play their hearts out — the piece deconstructs into a more traditional acoustic sound at its conclusion. 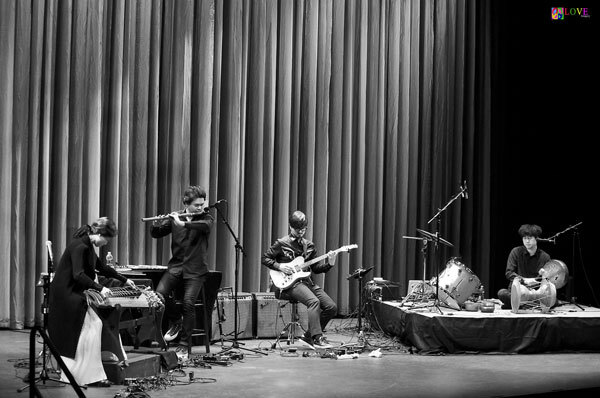 Opening with the sound of a pre-recorded bass drone, guitarist Jean Oh adds electronic beeps and buzzes via the use of his iPad to accompany Aram Lee’s recorder-like wooden flute. 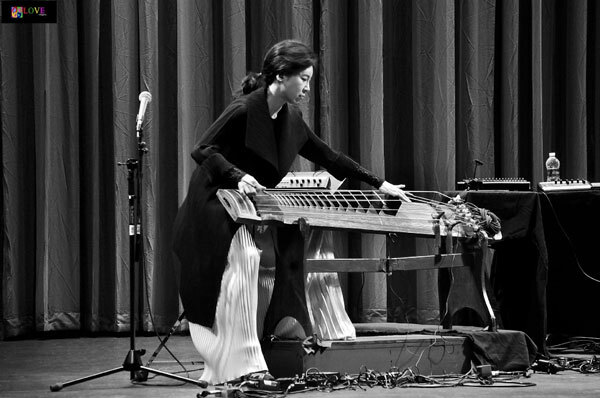 Heo plucks the strings of her geomungo with her right hand as her left hand deftly presses on the instrument’s frets. At times, she plucks the natural silk strings with a bamboo stick. 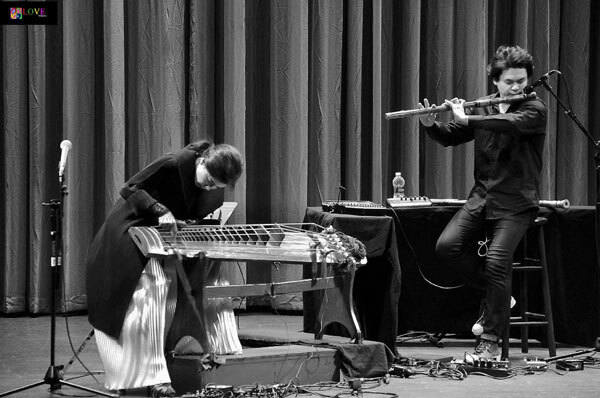 At other times, Heo either strikes the strings with the stick or uses the stick to tap out rhythms on the wooden base of the instrument. 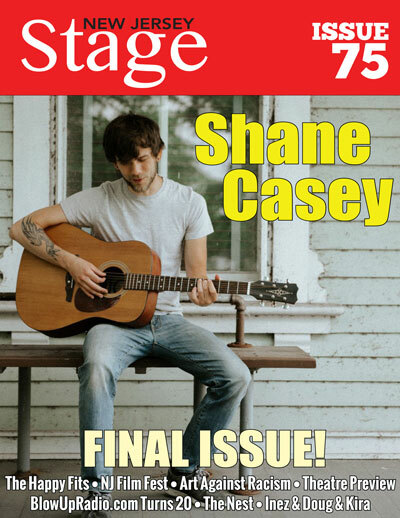 As the trio of musicians continue to play, Lee’s flute trills along with Oh’s electric guitar to the accompaniment of the geomungo and the ever-present drone of the bass. After large applause, drummer Hwang returns to the stage and Black String performs the title song from their CD, Mask Dance. The sound of quick and rhythmic electric guitar strumming and geomungo playing fill the room, the powerful drums chanting along. On this piece, Hwang sings, vocalizing sounds from deep within his soul, sounding mournful and raw. 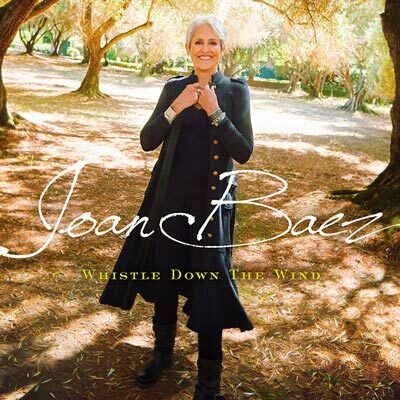 The wooden flute echoes the piece’s sentiment, vocalized by Lee to change the instrument’s timbre with each breath. At the conclusion of the piece, group leader Heo takes a moment to chat with the crowd, thanking them for coming to the show. 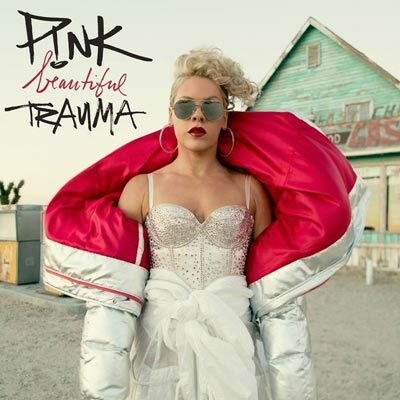 Starting with mellow electric guitar, the melody sounds like a prayer. Once again, Hwang sings, his soulful voice pleading, accompanied by the plucked strings of the geomungo and the windy sound of the bamboo flute. 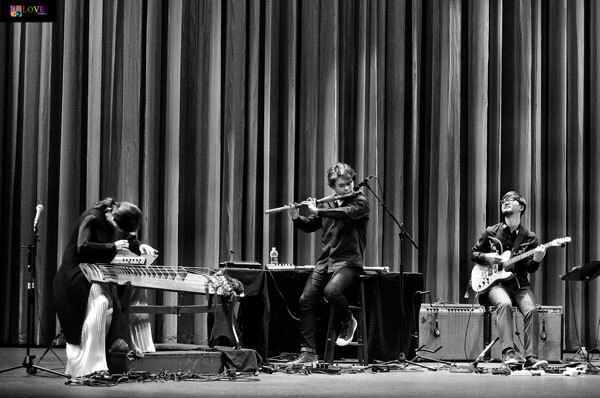 Lee opens this piece with his flute modified via an electronic effects device to alter the sound, making it seem surreal. Heo scratches the strings of her geomungo with a bamboo stick. She then proceeds to bounce on the strings with the stick creating a unique timbre which is more noise-like than melodic. Hwang rattles shells and follows that up with frantic drumming which is accompanied by Oh’s rhythmic and distorted guitar playing. As they perform, the quartet produces an innovative and dynamic piece of music which one must experience and feel as well as hear. On this composition, the soft wailing of Lee’s flute opens the piece. 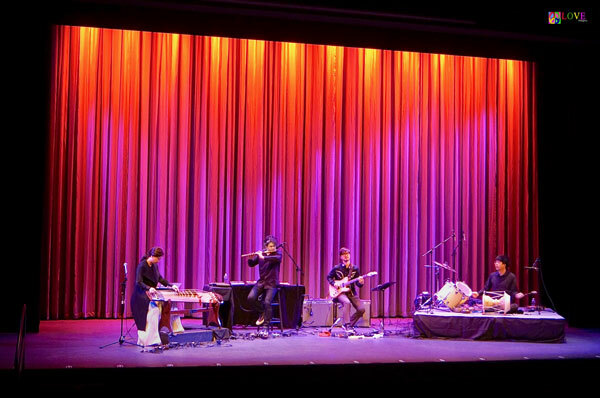 Rhythms build with Heo’s geomungo, Lee’s flute, Oh’s guitar, and Hwang’s drums, all four musicians playing together to reach a dramatic and satisfying conclusion. 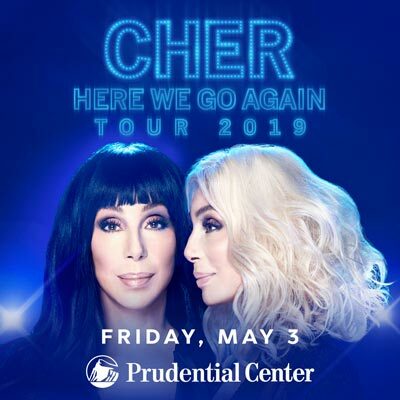 Heo announces that the last tune of the evening will be “Dang, Dang, Dang,” a title which she asks the audience to repeat after her. After having Hwang play on his drum a sample of the “traditional Korean simple regular rhythm” on which the song is based, the piece begins. Appearing to “beat box” into the flute, Lee plays extremely rhythmically. 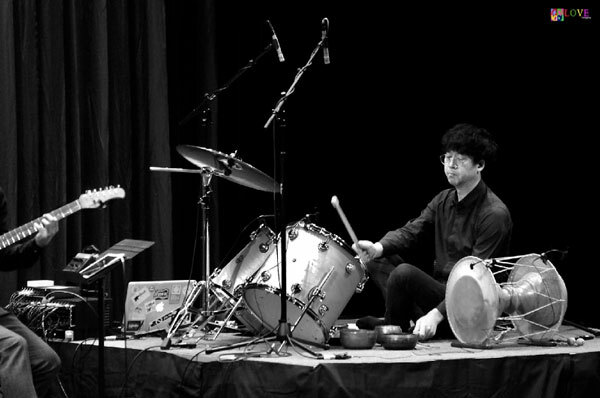 Soon, percussionist Hwang beats out the traditional Korean drum rhythm the audience heard earlier as the other musicians watch and listen. 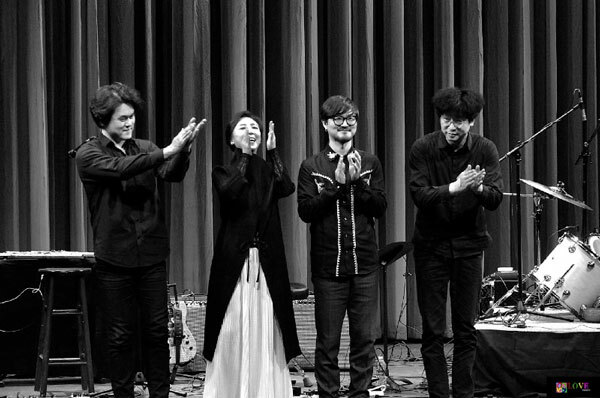 Before long, the entire group is playing together, creating a compelling piece of world music which fuses traditional Korean melody and rhythm along with the creative spark of contemporary jazz improvisation. The audience claps and cheers for this unique and powerful performance before the group responds with their own applause for the audience! As the members of the crowd make their way out of the auditorium and into the Grunin Center lobby, quite a few take an opportunity to meet the musicians of Black String. At this time, we take a moment to chat with group leader Yoon Jeong Heo. 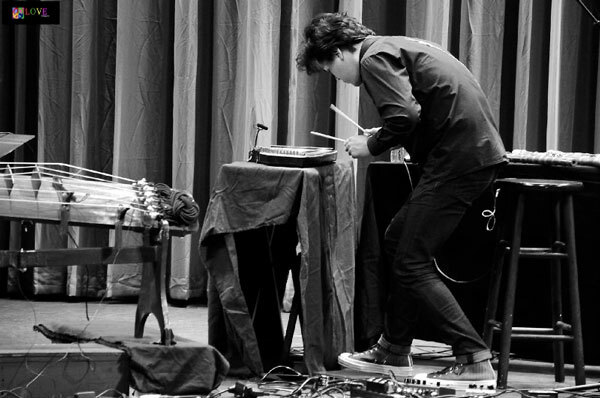 An enthusiast of “avant-guard music,” Heo acknowledges that in order to make her instrument sound more contemporary, she uses “a collection of assorted electronic effects boxes” located on the floor. As Heo and her bandmates meet and greet many of the audience members in the Grunin Center lobby, we take a moment to chat with several concertgoers who share their reactions to tonight’s performance by Black String. Next, we chat with a couple from the local community, here tonight to experience a unique presentation of world music by Black String. As we make our way out of theater and out into the evening air, we catch up with two more concert attendees — a pair of smiling Ocean County College students who seem extraordinarily pleased to have been here for tonight’s performance by Black String. 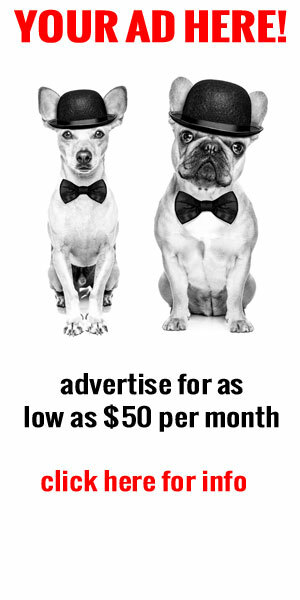 To learn more about Black String, please click on sori.nyc/blackstring. For information on upcoming performances at the Grunin Center of the Arts — including An Intimate Evening with Rickie Lee Jones on Mar. 22, Tom Chapin and the Chapin Sisters on Apr. 21, and Peter, Paul and Mary’s Peter Yarrow on May. 11 — please go to grunincenter.org.